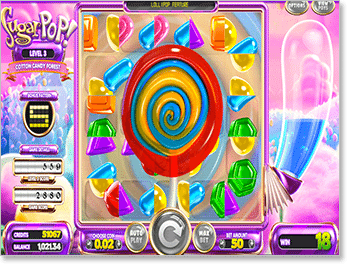 Sugar Pop by BetSoft is one of the most original real money pokies games on the Web. While it may seem simple enough at first glance with all its sunshine and lollipops, this interactive 3D slot boasts a unique Tetris-style reel system that allows us to win multiple times per spin – and the more we win, the quicker we can level up and unlock whole new worlds and special feature symbols. Pokies fans can play SugarPop at any of our top-ranked BetSoft casinos recommended in the table above. Each of these trusted pokies sites stocks hundreds of real cash slot games for instant play on PC and Mac, as well as mobile pokies for smartphone and tablet devices. Every one of these online casinos is fully licensed by leading gambling jurisdictions, supports a multitude of secure banking options, and has earned the seal of approval from international gambling authorities such as eCOGRA (eCommerce Online Gaming Regulation and Assurance). Check out the links above to sign up and score hundreds of dollars in bonus money when signing up. 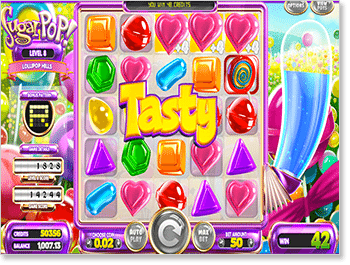 Aside from the tasty 3D graphics and mouth-watering candy symbols, the first thing you will notice about the Super Pop online slot is the unusual layout of the reels. Where most five-reel video pokies come with three rows of symbols, this one has five – which gives us an extra 10 active spaces per spin, for 25 in total. This means we get more symbols to work with, which in turn means we have more chances to put together winning combinations. The next point to note is that there are no paylines to speak of. This is because we can win simply by connecting three or more candy symbols in any direction. So while in most Internet slots all combos must start on the first reel and fall in a specific pattern from left to right, here we can score payouts with all manner of shapes. All you need to do is connect each symbol with its likeness on an adjacent panel – be it left, right, straight up, or straight down. Now to the defining feature of the Super Pop online pokie, and one which separates it from the vast majority of real cash slot machines. Whenever you hit a winner, all the symbols making up that pattern will burst and disappear – much like when you complete a line in Tetris, or when you stack matching characters in the Nintendo Gameboy classic Mario and Yoshi. As a result, all the candies above the winning combo will slide down to fill the gaps and thus make room for new symbols. This process repeats until there are no more paying combinations on the board – so it is quite possible to rack up five, six, even a dozen pops on the trot. Thus, when you play for real cash at one of our trusted casinos – such as HouseOfJack.com – you effectively get multiple spins for the price of one. Because we can put together huge sequences of more than five symbols at a time, this system requires a special set of payout rules. So rather than set returns for matching three, four, or five icons, instead we get paid out per symbol. For example: the red candy symbol pays 20 credits; so if we connect six of them, we would win 120 coins (6 x 20 = 120). As there are no actual win lines to bet on, we must instead wager in fixed amounts per spin. With six coin sizes and the ability to stake anywhere between 50 and 250 credits each turn, we have an enormous spread of stakes to choose from – starting at $1 (50 x 0.20 coins) and escalating to a lofty $250 per spin (250 x 1.00 coins). Very few online pokies offer such a huge maximum bet, which makes the SugarPop real money slot a no-brainer for high-stakes pokies players. As you rack up winning combos on the Sugar Pop pokie, the glass bulb on the right-hand side of the reels will fill up with blue liquid. When the meter is full, you will progress to the next level. Passing a certain number of levels will not only take you to new worlds, but also unlock a range of special candy features. While each feature acts differently, they all essentially give you free spins by moving or removing random symbols once any paying candy combos have been cleared. Connect four of the same symbol to create a Super Colour multiplier. If the Super Colour feature combines with two or more candies of the same colour before the next spin, it will multiply the total combo win by the number shown. For example: we string together four orange candies to create a 2x multiplier Super Colour. If that multiplier then connects with two more orange symbols to make it three units paying eight coins each, the total payout for that combo will double from 24 to 48 coins (3 x 8 x 2 = 48). Link up five or more of the same candy to unlock the Colour Bomb feature. If this special symbol then connects with two or more candies of the same colour before the next spin, every same-coloured symbol on the reels will pay up. For example: our green Colour Bomb creates a winning pattern with two other green lollies, and there are nine green symbols on the reels in total. Each one of those green candies will shatter – and because greens pay 12 credits per symbol, our payout for that particular Colour Bomb combo will be 108 coins (9 x 12 = 108). To the left of the Sugar Pop reels you will see a small-scale diagram of the board with a shape highlighted on it. This is the Bonus Pattern, which takes the form of one of the letters in “Sugar Pop” (S, U, G, A, R, P, and O). Whenever you hit a winner on one or more of the spots that make up the Bonus Pattern, those squares will turn dark. When all the panels for that shape are darkened, the Bonus Pattern is complete – so the squares will turn light again and a new sequence begins. The more shapes you get through on a level, the bigger your score will be when you level up. Unfortunately, this little side game doesn’t get you any real cash rewards, but it’s a nice addition that contributes to the immersive quality of this 3D pokies game. Right now, there is no other Web slot quite like the SugarPop real cash pokie. We have seen exploding reels before – notably in Rook’s Revenge – but this game has taken that concept to a whole new level. As ever, the audio-visual features from BetSoft are second-to-none: everything is bright and colourful and pretty to look at, and the sight and sound of those candy shells shattering is incredibly satisfying. The animations for all the special candy features are clever and unique, too, while the background imagery for each new world really gives this title the feel of an old Gameboy or Super Nintendo game (Kirby’s Dreamland springs to mind). What’s remarkable is how little you miss the standard pokies features that aren’t there. Yes, a wild symbol of some kind would be nice, but the base game is so endlessly playable that you barely even notice the lack of a scatter feature or a dedicated bonus round. The best thing, though, is just how often you win. If you go more than three spins on Sugar Pop without hitting at least one winner, you can consider yourself extremely unfortunate. The freeform nature of putting together paying patterns, as well as the re-spin thing that happens after the candies pop, makes it easy to rack up multiple wins per spin. This is great for high rollers – imagine snaring eight or nine winning combos on a single $250 bet? – while for low-level bettors there is little risk of running up big deficits. The only real gripe we have is that there is no cash prize for finishing Bonus Patterns or levelling up. But nothing is perfect, as they say, and Sugar Pop already offers more than enough flat-out addictive fun as it is.